You can send text messages to a channel (a nice feature when for example complicated URL’s need to be passed on). First click on the channel you want to send a message to, otherwise you will send a message to the channel that is highlighted or the channel you are currently in. Then click on Send Text to Channel. 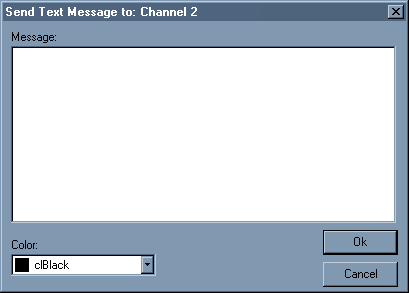 A new window appears with the channel you are sending your message to in the top bar. You can type messages (up to 255 characters) in the Message field. If you want to display your message in another color than then the standard black, you can modify it in the Color box. Links starting with http:// will be clickable. When you’re done click the Ok button to send the message to the channel you chose or cancel to cancel the message. You need the right permission to do this, check if menu Info, Show Permissions.